Engineers from Facebook, Twitter and Myspace have banded together to "Focus on the user:" a project that reworks Google's social search update to include all social networks instead of it's own. So as Google released Search Plus Your World to coincide with their social networking service, people realised that this wasn't exactly 'social' and it wasn't really 'your world.' As we made rather clear, for this to be seen as a social search it needs to be open, and that's exactly what this developed bookmarlet does. What was noted early into the process is that all these results were already ranked and indexed by Google. The company have just opted to feature results solely from their own social foray, which is understandable in a business sense, just not good for the consumer. 'Focus on the User' puts Google's curated search results against those that would be without constraint, and presents the more relevant (and socially active) to the forefront. This is done by entering your search term and pressing the "don't be evil" button, which opens the results up. If Google decides that it’s relevant to surface Google+ page as a result in any of the areas where Google+ content is hardcoded, the tool searches Google for the name of the Google+ page. 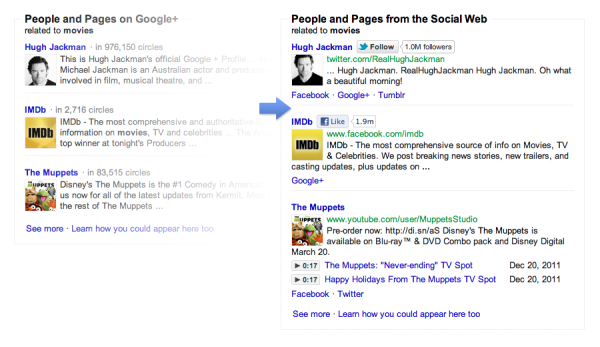 Then, the tool identifies the social profiles within the first ten pages of Google results (top 100 results). The ones Google ranks highest — whether they are from Flickr, Twitter, Facebook, LinkedIn, MySpace, Quora, Tumblr, Foursquare, Crunchbase, FriendFeed, Stack Overflow, Github or Google+ — replace the previous results that could only be from Google+. Emphasis has been placed on the fact that this doesn't use websites outside of Google, rather changing the code temporarily via doing background searching, finding the highest ranking social results and presenting them in prioritised order. As they say, it's just 'letting Google be Google.' This is available as an Open-source project, so feel free to reprogram as you wish; but for the majority of us, the 'don't be evil' button is free. Go get it by hitting up the source link below the video walkthrough.